Filly Imperial Star stepped up to Class 1 for the first time at Seoul Race Park on Sunday and, after three consecutive second placed finishes, made no mistake as she swept to the win in the feature race. While she benefitted from the late scratching of another filly, Mustang Queen, who beat her in the HRI Trophy last month, it was a performance full of promise from Imperial Star (Nihon Pillow Neil) and was her fifth career win. Down at Busan, Peter Wolsley’s Ghost Whisper (Gotham City) was in unstoppable form as he cruised to victory in the first of co-feature races. It his third straight win and his seventh in ten starts. It was also South African jockey Gerrit Schlechter’s third victory of the weekend and his biggest since starting at Busan earlier this month. Ghost Whisper is now established as Aussie trainer Wolsley’s stable star. In the second of the day’s co-features, the horse who formerly had that status, Gyeongkwaehanjilju (Tapit) put in a second consecutive disappointing performance since supposedly recovering from whatever ailed him in the season-ending Grand Prix Stakes last year. While at Busan, the foreign jockeys were on top form – Yukio Abe also got three winners on Friday, at Seoul it was the turn of the women. It had been nearly two years since Yoo Mi Ra last tasted victory. However, she brought that dismal run to an end with a smart victory in Saturday’s race 8 on Real Play (Field Asuka). In the time since her last winner, Yoo Mi Ra has been overtaken by two other young female jockeys. Lee Ah Na was among the winners on Saturday while on Sunday it was the turn of Kim Hae Sun, who earlier in the year ceame the quickest woman to ride out her apprenticeship, to hit the board. 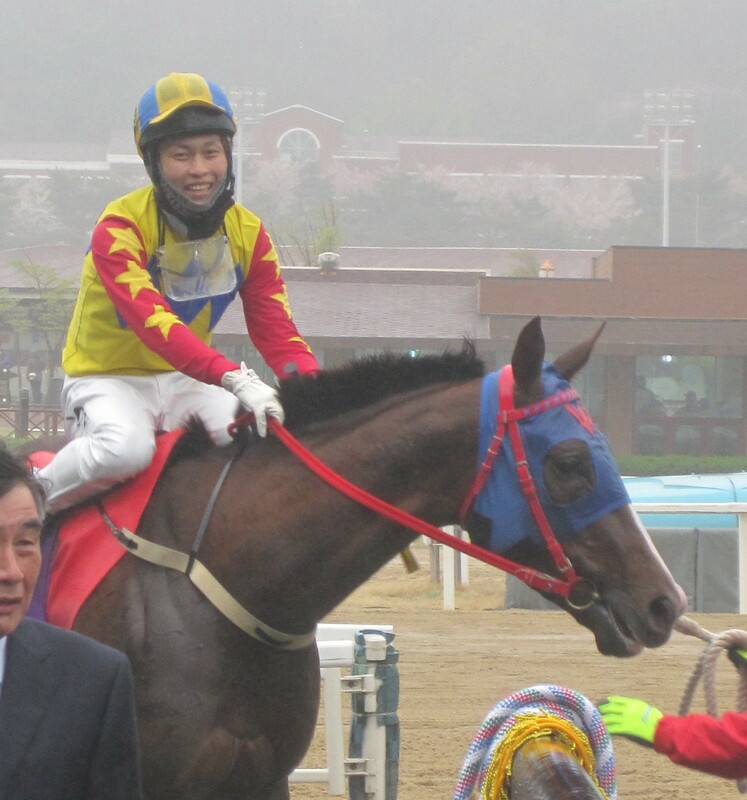 Kim took two wins, first on Naejangsan (Menifee) and then later on Ecoroof Star (Exploit). It takes the 23-year-old to 52 career wins and another step towards joining the top ranks of Korean jockeys – almost all of whom she is already more talented than. Next week Stakes action returns to the peninsula in the shape of the Gukje Sinmun Cup at Busan. Meanwhile, Smarty Moonhak (Smarty Jones) is among early entries for next Sunday’s feature race at Seoul with a 50/50 chance of running. The Korea Racing Authority (KRA) confirmed on Thursday that trainer Kim Myoung Guk has had his license suspended after being placed under investigation for alleged breaches of Korean racing’s very strict integrity laws. Although the details of the alleged offences were not made public at this time, these kind of charges generally relate to the illicit passing on of information that hasn’t been made available to the public. Kim Myoung Guk has been training since 1995 and has saddled 370 winners from 4597 runners. He won Korea’s most prestigious race, the Grand Prix Stakes with Flying Cat in 2006 and has sent out the winner of the Sports Chosun Cup on two occasions. The Owners’ Trophy and JRA Trophy are also among the big races he has won. Kim currently has 17 horses in his barn, an average size for Seoul, although he had yet to send out a winner this year. 17/1 outsider Cheonun sprinted past the favourites to land victory in an exciting renewal of the Owners’ Trophy at a rain-lashed Seoul Race Park this afternoon. With almost the whole field still in contention with a furlong to run, it was the 5-year old mare, 2nd in the Korean Oaks in 2010, who swooped wide and late to get the better of pre-race favourite Magnifique (Menifee) and second-favourite Real Victor (Biwa Shinseiki). 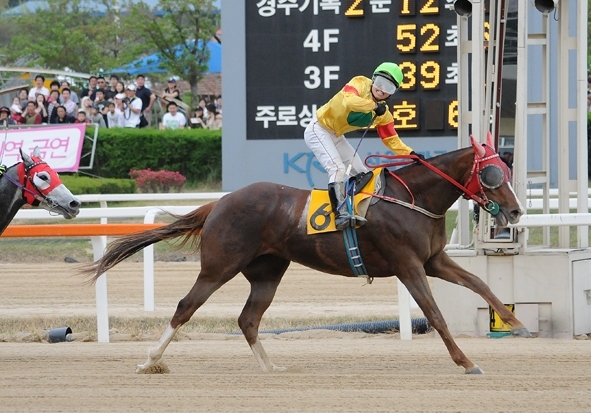 It was an 8th career victory for Cheonun (Ft. Stockton) and her third big race triumph, following wins in the 2010 Sports Seoul Cup and 2011 NACF Chairman’s race. This was, however, the first time she had beaten male horses in a Stakes race. She’s only been out of the money once in her 22 outings. 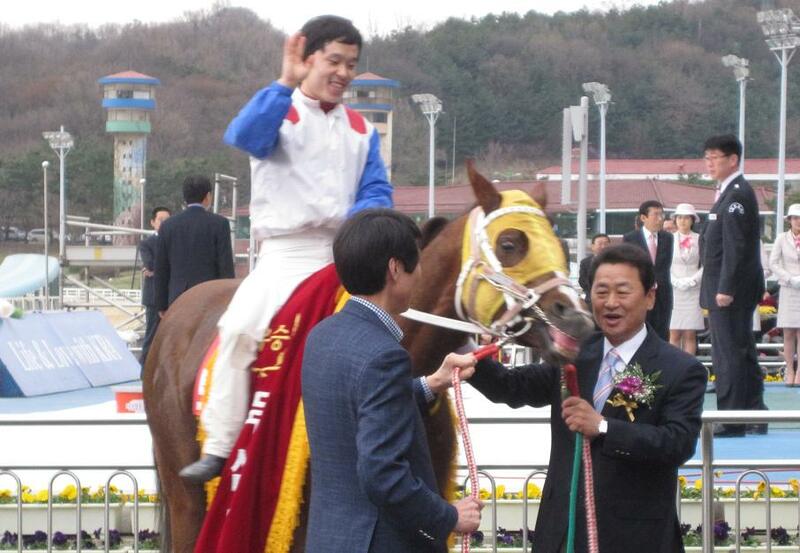 For jockey Jang Chu Yeol, less than two years into his professional riding career, it was a first Stakes victory. The 23-year-old is thought of as one of the best young riding talents in the country and last autumn rode two winners in the United States. If Cheonun can keep today’s form up, she may even find herself invited to the Grand Prix Stakes at the end of the season. After the Owners’ Trophy was done, last year’s Grand Prix winner, Tough Win (Yonaguska) put in his second appearance of the season. And despite carrying 63.5Kg, it was as routine as his first. This time, jockey Cho Kyoung Ho opted to drop Tough Win right to the back of the field and, instead of coming round the outside, went right through the middle in the home straight. Although for a very short time it looked like he may have trouble getting through, his victory was as comfortable as ever and the inevitable rematch between him and Smarty Moonhak is looking ever more enticing. In contrast to Seoul, it was a glorious spring day at Busan. 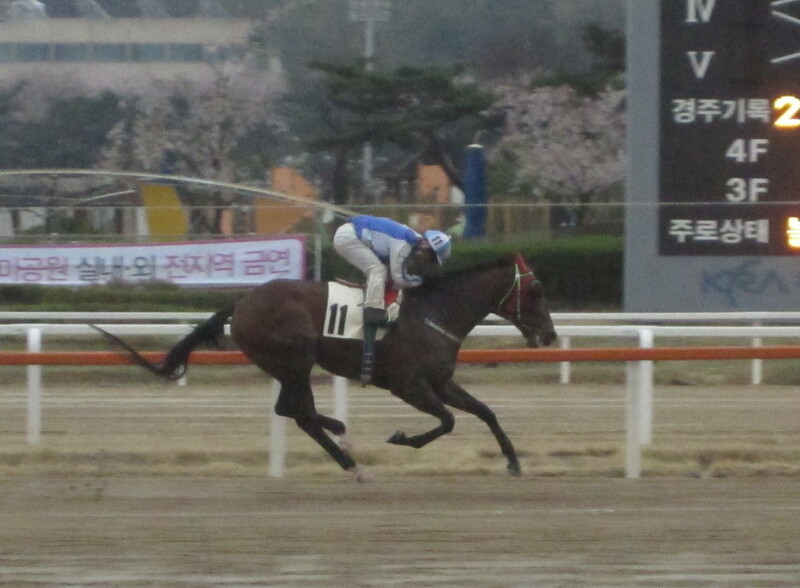 Double President’s Cup Dangdae Bulpae (Biwa Shinseiki) recordd a routine win in the afternoon’s feature. Of the foreign jockeys at Busan, Japanese riders Yukio Abe and Narazaki Kosuke were both on target, but South African Gerrit Schlechter was unable to follow-up on the double he rode on Friday, drawing a blank from 4 rides. By the end of the year, Korea may well have its first female President. Of course, the woman in question has had some advantages. She is, after all, the daughter of the dictator who presided over nearly two decades of extraordinary economic development – and numerous human rights abuses. However, if it happens, it will still be an historic moment. There is another woman worthy of respect; a woman who should be headlining news bulletins and giving speeches at the nation’s top Universities. For more than ten years, Lee Shin Young has been achieving things no other woman has ever before come close to in the ultra-male dominated world of Korean horse racing. Today, she achieved a little more. 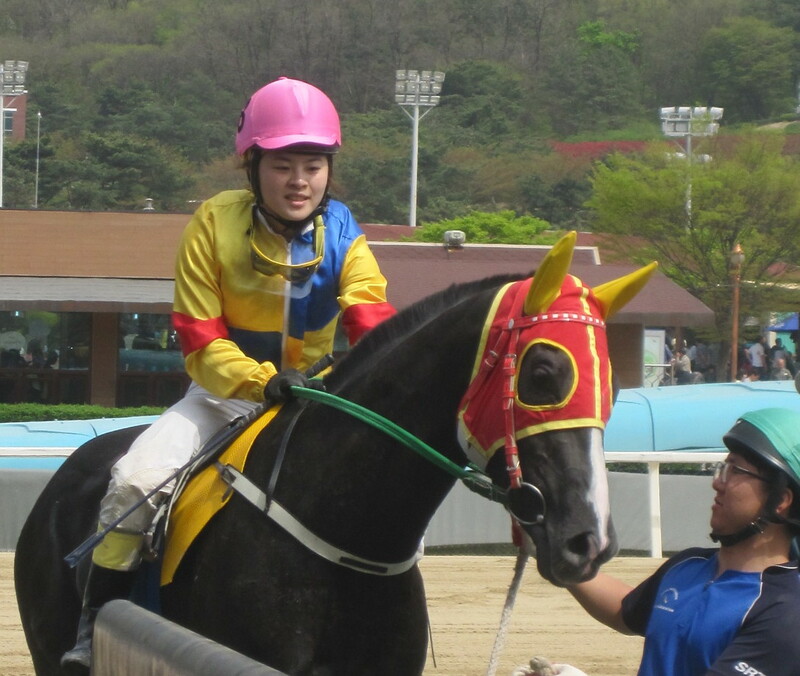 Lee Shin Young was only the third Korean woman to gain a jockey license. She rode 90 winners before last year, at the age of 31, becoming the first Korean woman to qualify as a trainer and open her own barn. It would be wrong to say that most expected her to fail. Even those who may wanted have her to fall on her face – and there were some – knew enough about Lee to not make the mistake of underestimating her. A formidable character and talent, she was always going to succeed. With 15 winners from her first 100 runners, Lee entered four-year old colt Holy Moely (Nihon Pillow Neil) into the Selangor Turf Club Trophy at Seoul Race Park today. Under jockey Shin Hyoung Chul – 13 years Lee’s senior, the 9-1 chance led from gate-to-wire in driving rain to record a comfortable victory. It wasn’t a Stakes race, but it was by far the biggest win of Lee’s training career to date. She has 17 horses under her care now and more are likely to come. You never see a woman leading-up or hot-walking a horse at Seoul or Busan. However, young jockeys such as Kim Hae Sun and Lee Ah Na are coming through and there are now more young women in the KRA’s education system. Check their Facebook pages and without fail, they list Lee Shin Young as the person they most admire. She’s unknown outside of racing circles and she’s probably not at all bothered by that. She should be as what she has achieved deserves wider recognition. What’s most exciting though, is at just 32 years of age, her greatest achievements are perhaps still yet to come. Distances: 2.5 lengths/1 lengths – 14 ran. It’s been an absolutely stunning week on the peninsula. Temperatures have been in the low twenties, the sun has been shining and the cherry blossoms have finally come out. Naturally as soon as the working week is done, it’s set to pour with rain on Saturday and Sunday. Hopefully that rain won’t put too much of a dampener on what is a double-header of big race action at Seoul Race Park this weekend. On Saturday, it’s the Selangor Turf Club Trophy while Sunday sees the Group 3 Seoul Owners’ Association Trophy. The STC Trophy is the latest edition of the exchange race that the KRA holds in partnership with Malaysia’s Selangor Turf Club. Two apprentice riders have joined the usual dignitaries in making the trip to Seoul this week and will ride in the race which sees fourteen class 2 Korean bred runners compete over 9 furlongs. The main event of the weekend, however, is on Sunday. The Owners’ Trophy also has a full field of fourteen and is headed by former Ttukseom Cup winner Triple Seven (The Groom Is Red). Ilgan Sports Cup winner Geuma Champ (Vicar) makes his first appearance since finishing third in last year’s Minister’s Cup while in-form Real Victor (Biwa Shinseiki) and Suseong TX (Concept Win) also go along with the always dangerous Magnifique (Menifee) and Cheonun (Ft. Stockton). It is set to be an intriguing race. Once the Owners’ Cup is done, Grand Prix champion Tough Win (Yonaguska) will make his second appearance of 2012. He’ll be carrying an unprecedented 63.5kg against eleven rivals in a 1900 metre handicap. Down at Busan there are co-feature races on Sunday. Double President’s Cup winner Dangdae Bulpae (Biwa Shinseiki) is the star attraction. Useung Touch returned to action for the first time in five months and last year’s Korean Oaks winner didn’t disappoint as she got the best of a stretch duel with older horse Quantum to win the feature race at Busan this afternoon. The outstanding Korean filly of last year, Useung Touch (Menifee) finished second in both the Korean Derby and in the final classic of the season, the Minister’s Cup. Despite her last appearance having been in the President’s Cup at Seoul last November, punters were confident enough in her ability to send her off second favourite behind Quantum (Ecton Park), a later-starting five-year old who had won six of his nine starts to date, in the 1400 metre feature race. It would be those two who would battle it out over the final furlong with Useung Touch just managing to get her nose in front at the right time to claim victory by a head. Useung Touch now has six wins from her twelve career starts and could be an interesting addition to the big summer handicaps. Up at Seoul there was a little bit of history as two female jockeys landed doubles for what was, as far as anybody at the track could remember, the first time ever. First year apprentice Lee Ah Na won race 1 on racecallers’ nightmare I Love You (Chief Pete) before following up with a fine ride on Cheonseung (Chief Pete) to claim race 6 and take her career tally to ten winners. This means that she has ridden out the first of her weight allowances and from now on will only be able to claim 3Kg. Earlier this year, Kim Hae Sun rode out her allowance completely – the quickest Korean woman ever to do so. Naturally, things have been a little tougher since, but she has continued to consistently ride winners. Today she got two more, first on Miracle Party (Biwa Shinseiki) in race 2 (for Korea’s only female trainer, Lee Shin Young) and then in the last on Cheopgyeong (Vicar). Kim and Lee are at the forefront of the new wave of very good young riders at Seoul (so far it’s not been repeated so much at Busan) and look on course to become the first Korean women to really break through to challenge the top riders for the top rides. While the official feature race at Seoul was won by favourite Khanui Huye (The Groom Is Red) most eyes were on race 9 and the fourth appearance for the as yet unbeaten US import Grand Niner (Any Given Saturday). He’s still unbeaten. Under Oh Kyoung Hoan, he led from gate to wire and while the jockey did chosse to give him some reminders in the home straight, he recorded a relatively comfortable two length win. Runner-up was in the 1900 metre race was Es Four (Smarty Jones). There is currently only one other horse by Smarty Jones running in Korea and while Smarty Moonhak’s connections will not be overly intimidated by what they saw today, if Grand Niner continues to improve, he will be competing at the highest level very soon. * South African Gerrit Schlechter was unable to land a winner on his first weekend of riding at Busan, however, Japanese newcomer Yukio Abe was on target, guiding Lunar Spike (Malibu Moon) to a battling victory in race 3. 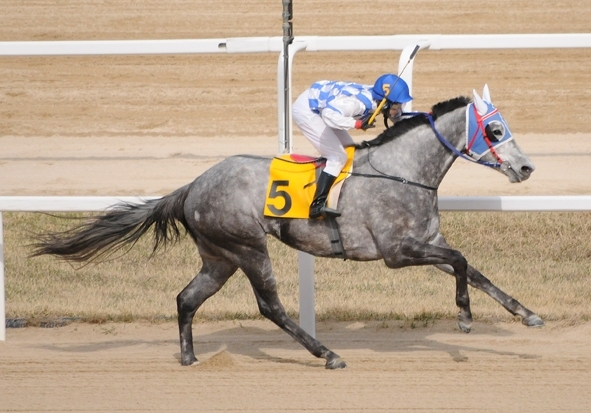 * Busan’s co-feature race went the way of US four-year old Viva Ace (Macho Uno) – his eigth win in sixteen starts.